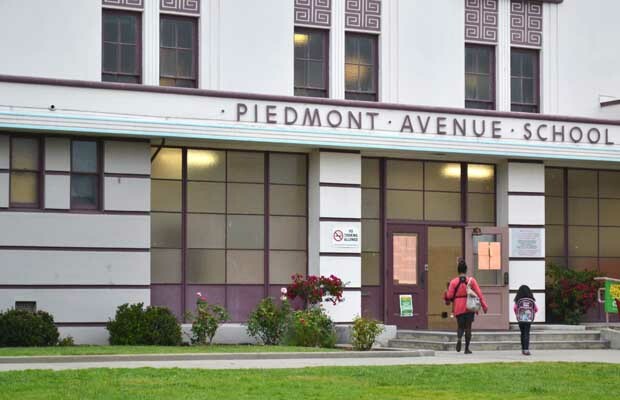 Zarina Ahmad, principal of Piedmont Avenue Elementary in Oakland, put extra effort this year into creating a bright first day of school. She and her staff pasted a class list to the outside wall, with a photo of each teacher. Big orange cones separated children by their grades. Teachers ran a short pep rally, called the “Line Up to Learn.” Uniformed Oakland firemen welcomed kids into the school. On Saturday afternoon nearly 200 protestors showed up for a 1.7 mile march organized by a coalition of community organizers, Occupy Oakland supporters and Lakeview Elementary parents to protest the closure of five Oakland elementary schools by the Oakland Unified School District. By 7 p.m. on Monday night, the encampment at Lakeview Elementary School that drew over 200 people from the community had quieted. Parents, teachers, and activists who had taken over the school in protest of the district’s plans to close it and four other elementary school campuses were preparing for the night’s rest and having two roundtable meetings outside of the school. Protesters at an encampment that has been growing for the last four days at Lakeview Elementary School, just off Grande Avenue, have been served with notices from the Oakland Unified School District to leave the school immediately and not return for 30 days. School is out and parents who disagree with the Oakland Unified School District board’s decision to close five elementary schools—Lakeview, Lazear, Marshall, Maxwell and Sante Fe—at the end of this school year are protesting by building an encampment on the Lakeview campus, just off Grand Avenue. More than a hundred parents and teachers packed the Oakland Unified School District’s boardroom for Wednesday night’s meeting, with dozens more watching from the 4th floor overflow room, following a march from Laney College earlier that afternoon. The topic of contention: school closures.